“A great wave of salty, sustaining literary fare” was how guest speaker Vincent Woods vividly described the joys of Cúirt at the launch of this year’s programme, at the House Hotel on Tuesday evening. 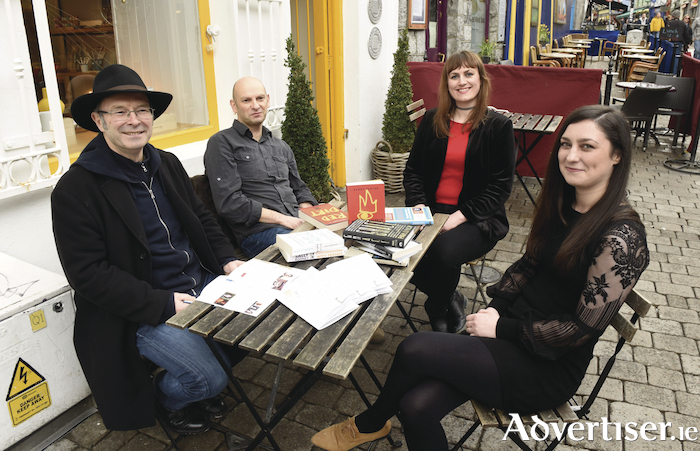 The venue was thronged as Galway’s readers and writers turned out in force for the occasion. The line-up for the 20187 festival sees some of the most exciting authors, poets, performers, and artists featuring at more than 70 events, many of them free, across poetry, prose, music, and spoken word. The programme also includes theatre, talks, masterclasses, family events, and exhibitions. Writers from America, Austria, Canada, Catalonia, Britain, France, Mexico, and Norway will feature alongside Irish authors. Featured writers include acclaimed American novelist and Winter’s Bone author, Daniel Woodrell; Bernard MacLaverty, winner of the ‘Novel of the Year’ prize (for Midwinter Break ) at the 2017 Bord Gáis Energy Irish Book Awards; renowned Mexican writer Juan Pablo Villalobos; leading Catalan writer, Eduard Márquez; Pakistani-born British poet and artist, Imtiaz Dharker, who was also a winner of the Queen's Gold Medal for Poetry; and Irish writer, scholar, and leading international authority on Irish literature, Declan Kiberd. A commitment to Irish-language writers is a significant feature of the festival, with readings from Marcus MacConghail, Ailbhe Ní Ghearbhuigh, and Simon Ó Faoláin; Darach Ó Séaghdha will lead a discussion about the work of Flann O’Brien; and Mick Óg McGee will present excerpts from his newly published play, Aislingí Grádha Oídhche Lughnasa. A spotlight on digital literature will examine the intersection of literature, digital, non-digital, mixed media, and other art forms with JR Carpenter, Jason Nelson, Alinta Krauth, Álvaro Seiça, and Justin Tonra, who all work across digital and non-digital domains. They will examine the exchanges between print and digital with one particular session drawing on encounters with printed books through augmented reality technologies. The programme’s strong international presence and showcasing of different forms of writing reflect Cullen’s view of Cúirt; “Common humanity underpins my vision for the festival and a lot of the international writers were deliberate choices,” she reveals. “I wanted to amplify and give a platform to the Catalan voice which I have not heard much from, and Eduard Marquez is a leading Catalan writer. I am also excited about Juan Pablo Villalobos from Mexico. think his reading, alongside Pat McCabe, will blend the macabre of rural Ireland with the macabre of rural Mexico, his reading will be exciting." Cúirt International Festival of Literature runs from April 23 to 29. Tickets for all events are on sale now on www.cuirt.ie or from the Town Hall Theatre (091 - 569777, www.tht.ie ). Jobs Expo, Ireland’s largest careers fair, is returning to Galway on February 24th!! 50 First Dates Galway – Will we be as lucky again this year? Page generated in 0.1003 seconds.